This is an unusual Choreofest. Four pieces in particular bring something new or different: Torelli, Battlefields , Ebony Concerto and Passage. 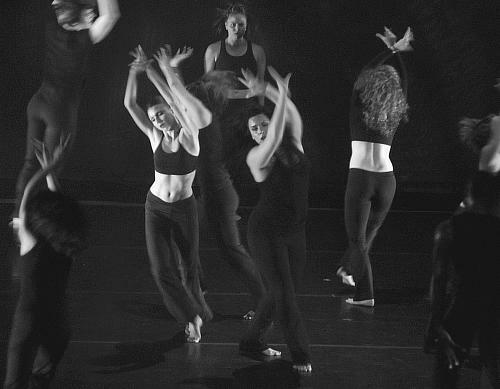 Torelli, a piece by Twyla Tharp was restaged by one of the student dancers, Chloe Abel. This comes about as a result of working with KC Ballet's William Whitener (himself a former Tharp dancer) on Tharp's Deuce Coup. More on this below, but Chloe was handed a singular and unusual responsibility for a dance student. doing this they also set a duet ("Unfold") on Wylliams/Henry with DeeAnna Hiett, Holly DeWitt and Winston Brown. orchestra which will occupy the upstage right quarter of the stage. The dancers will work down stage and stage left. (i.e. this fall, directing Karah Abiog in the September Wylliams/Henry, as she herself was still recovering from injury in the May 2008 concert). White hall was full both nights. This shot is from the back of the balcony during Intermission. This is the location used for the overhead friday performance shots below. See sections below for an expanded treatment of each of the eight pieces. The credits and acknowledgements below are copied directly from the concert program. Molly Vaeth in front of choreographer Paula Weber (left) and lighting designer E.J. Reinagel. Cappriccio borrows upon the social traditions and dance steps of Galliard and the Volte from the Renaissance Period. This "Great Works Project" was made possible by the generosity of the Nottberg Foundation. Chloe Abel as she tells the audience about "Torelli" then heads backstage. Ms. Abel explained that the piece, as it comes from Tharp is a do-it-yourself kit with music, video reference and units of choreography which each licensee arranges and connects in their own manner. So instead of a frozen arrangement, Tharp's pieces become collaborative variations reflecting both Tharp and the dancers performing it. That means you are not seeing the original 1971 Tharp piece. Instead you are seeing an ever-changing version reflecting the resources and abilities of each organization. Kelanie Murphy in front, during dress rehearsal, shot from stage front position. The same place in the dance as just above. Kelanie Murphy in front, during friday performance, shot from balcony, back of house. Chloe Abel (center) on the near end of the bench directing her arrangement of Twyla Tharp's piece. On the bench from far to near: William Whitener artistic director of Kansas City Ballet (KCB), Paula Weber Dance Division chair, and lighting guy E.J. Reinagel. Whitener was visiting as a professional courtesy to both Paula and Chloe. Bill Whitener is a former Tharp dancer. 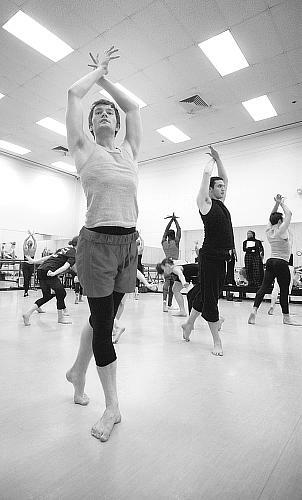 As artistic director of KCB Whitener has put on various Tharp pieces. Chloe came out of training at the KCB School. During KCB's fall 2006 performace of "Deuce Coupe" (by the professional company) Whitener said he had Chloe learn a solo section which she performed as a student at the end of the year for KCB's school program. Last summer (2008), Whitener said, Chloe worked on "Torelli" for the KCB School which makes the UMKC production the second time she has arranged Tharp material. Whitener noted that the two "Torelli" productions (KCB School and UMKC) are separate licenses and not otherwise connected. 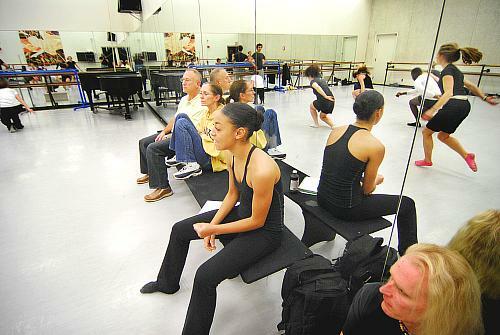 A moment in rehearsal/class for "Whilte" - Marie Buser (facing, pink tank) talking with Myesha McGriff (back to camera). Next in line toward mirror: Caitlin Shuler, Stephanie Shipman, Kelanie Murphy. 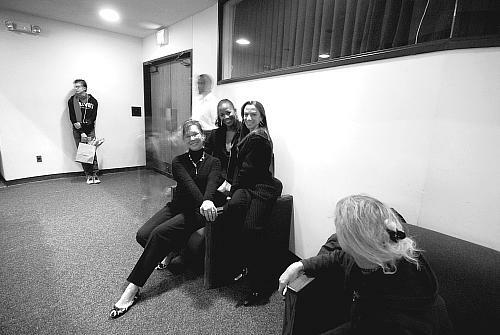 At left, on bench: Paula Weber (teacher/choreographer). Working in front of her, reflected in mirror: Nicolette Miller and Eric Sobbe. Entering from "upstage right" (in studio 103, by the main door) Eric Sobbe (carrying) and Nicolette Miller (top). Eric Sobbe and Nicolette Miller - in studio rehearsal (see performance below) shot from "ground" level. Eric Sobbe and Nicolette Miller - in performance version of the studio shot above, shot from the balcony in back during the friday performance. This piece is a new version by DeeAnna Hiett, this time adding two more women. In the past Passage has been with one woman and three men. Now it is three and three. Battleworks - UMKC dancers in a first rehearsal for this piece. Despite the scrum-like first glance look to this formation, note the coordinated foot positions, even this early in studio rehearsal. Here the dancers are turning as they move outward, going from a tight formation to specific positions in a large circle. Robert Battle demonstrating. On the left is Erika Pujic (Battleworks dancer and rehearsal director for this work), Robert Battle, Mary Pat Henry, Sabrina Madison-Canon. Patrons turned out in large numbers on Nov. 7-8 for the UMKC Conservatory of Music and Dance annual Choreofest Fall Concert, filling White Recital Hall almost full to capacity both in the balcony and the main floor for both nights. 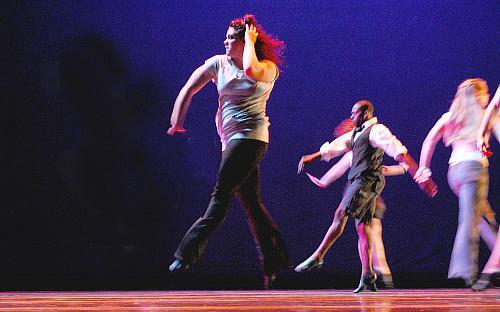 This year's Choreofest 2008 treated audiences to an impressive array of choreography by both well-known artists in the field and dance faculty, performed heroically by the latest remarkable group of students in the dance program. Each year the Conservatory dance students get better and better, both coming into the program, and going out, and this year's ensemble was true to form. Although these young dancers sometimes do get rattled at times and make minor errors, their technique and performances, on the whole, are quite good, and are competitive with local semi-professional dance groups. 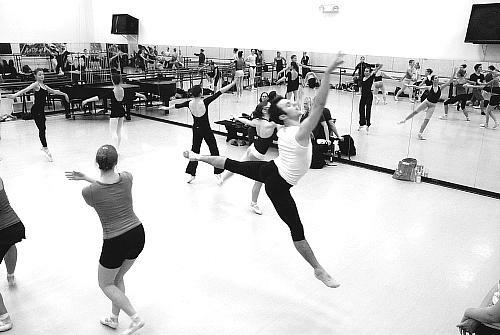 Although the Conservatory's Dance Division has always had a very good reputation for quality teaching and producing professional-ready dancers, it has really blossomed in recent years under the leadership of Mary Pat Henry and Paula Weber, and with the generous support of former Conservatory Dean, Randall Pembrook. And their efforts have certainly paid off. 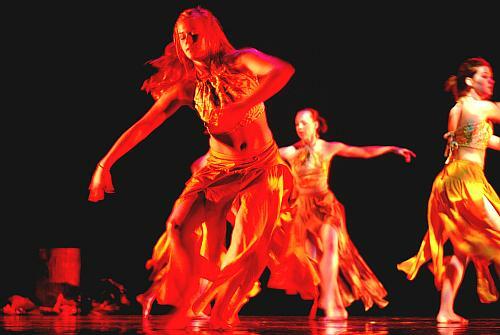 The UMKC Dance Program was recently academically accredited and the dance students are better than ever. And so is the choreography that the dance students are performing. This year's Choreofest included student dancer performances of choreography by Robert Battle, Mary Pat Henry, DeeAnna Hiett, Sabrina Madison-Cannon, Paula Weber, Rodni Williams, and Twyla Tharp. 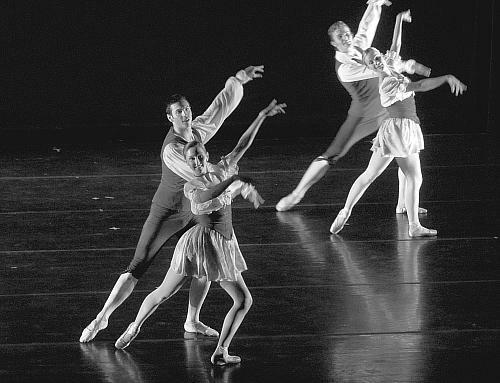 The latter piece is a student arrangement of a popular Tharp work, and competently done by Chloe Abel, under the auspices of William Whitener, artistic director of the Kansas City Ballet. The show opened with Off Center, choreographed by Paula Weber to music by Kenji Bunch. This was a fun, contemporary ballet performed in white shorts and medium-length tutus. Entertaining and engaging, this ensemble piece gave the show a light-hearted and lively start. "The name of the piece comes from the fact that it is an odd little piece... off-center," said choreographer and Dance Division chair, Paula Weber. "Odd and fun." 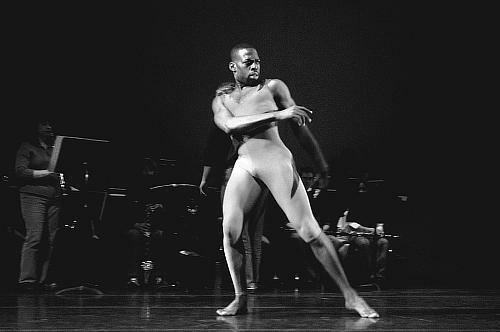 The next piece on the program was In the Midst of.... Choreographed by modern dance faculty, Rodni Williams, to music by Full Circle and Diane Reeves, this dark, moody piece was a barefoot modern composition along the lines of Alvin Ailey with a dash of Alwin Nikolai, but in a style unique to Williams. The number was performed in skirts composed of ragged strips, under high-contrast earth-tone lights reminiscent of firelight. This Williams work was effectively primal and woeful. 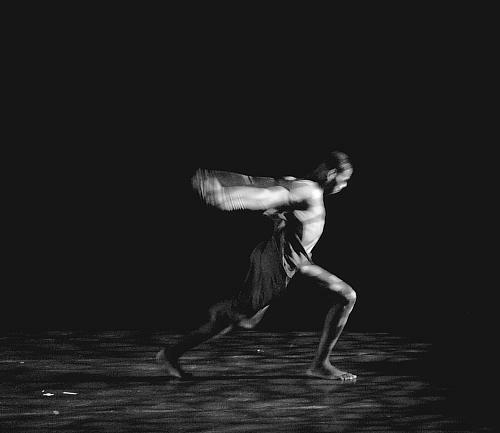 "It is a dance about survival and taking care of each other," said Rodni Williams, describing his work. "It concerns the turmoil of our times... inspired by the turmoil and environmental disasters that we have experienced recently.... and particularly Hurricane Ike." 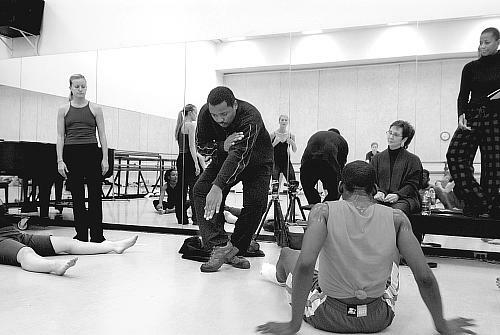 "In the dance, people take care of each other, which is what w need to do in today's times," added Williams. Next on the program was a delightful sextet, Cappriccio, choreographed by Conservatory Assistant Dean, Mary Pat Henry. Borrowing from the court dances of the Renaissance, Henry used steps that later became the roots for the classical ballet we now enjoy. Using the Renaissance forms of the Galliard and Volte as a character motif, Henry skillfully wove classical ballet steps into the court dance structure. The dance was choreographed to music by Carlo Farina, but performed by jazz violinist, Noel Pointer, giving the piece an added dose of whimsy. 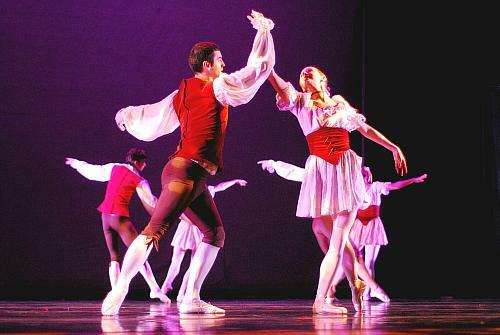 "I had always wanted to do a ballet based on Renaissance court dances, since that is where ballet evolved," said Mary Pat Henry. "It is based on a classical ballet vocabulary.... but it is influenced by the actual steps of the Galliard and the Volta from the Renaissance ... and it is a Renaissance piece of music .... but played by a jazz musician violinist.... so, I also incorporated some whimsy as well into the choreography." The Twyla Tharp piece, Torelli, was next, arranged by a very promising student, Chloe Abel, a junior in the dance program. No stranger to contemporary music, she is the daughter of famed KC jazz musician, Milt Abel. She distinguished herself early as dance student at the Kansas City Ballet School, and was hand-picked by William Whitener, artistic director for the Kansas City Ballet to assist him when he reconstructed the Twyla Tharp piece, Deuce Coupe, for the Kansas City Ballet last year, and she performed a section of it for the KC Ballet's year-end show. As a result, Abel was asked to teach the Torelli choreography to KC Ballet School students over the summer, which then lead to the opportunity to set the choreography on UMKC dance students. This was a task of extraordinary responsibility and skill for one so young, and speaks to her abilities as future dancer, choreographer, and dance mistress. 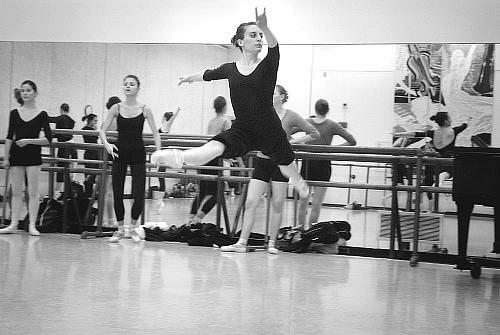 "Chloe has a remarkable sense of timing," said Paula Weber, ballet faculty director and chair of the Dance Division. "It makes her a very promising dance mistress, as well as an accomplished dancer." After Chloe Abel arranged the choreography and rehearsed her peers, William Whitener agreed to watch the rehearsals and critique her work. "She did a great job," said Whitener, after reviewing her work. 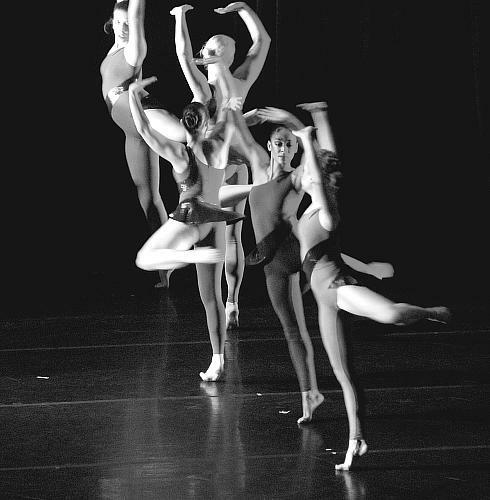 Abel was true to the Tharp style and timing, using all the dancers available to her in typical Tharp staging. 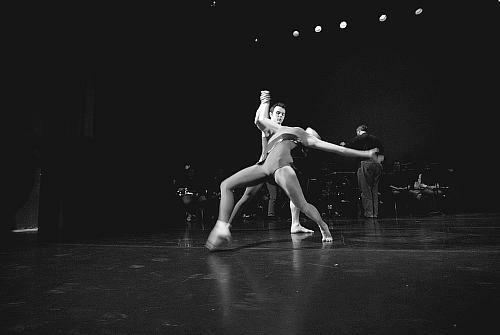 The Tharp technique uses very natural movements in a style of choreography that overlapping layers of ensemble work one atop the other, making a very complicated, busy motif. 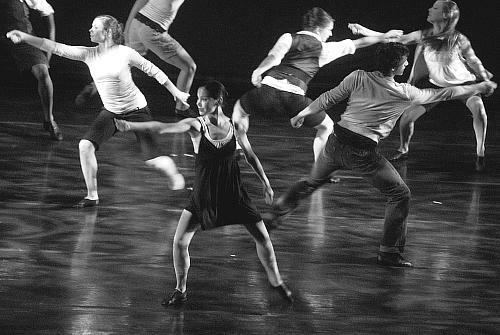 It uses lots of dancers moving in lots of directions simultaneously, with overlapping vignettes. Despite the complexity, Chloe Abel and her dancers managed to pull off the intricate choreography with great enthusiasm, making a fine showing. "I think the performance went well," said Chloe Abel about the number. "I could feel the energy from the wings so that was a good sign." After the intermission, the show reopened with Igor Stravinsky's Ebony Concerto, played live by members of the UMKC Conservatory's Music and Wind Ensemble, conducted by Steven D. Davis and featuring Dr. Jane Carl as clarinet soloist. 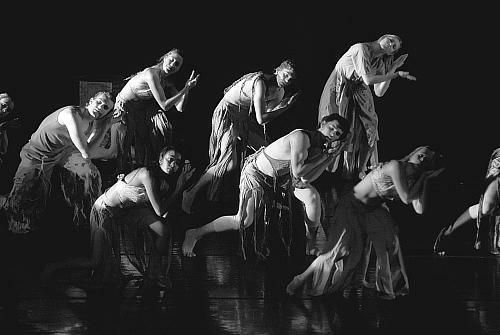 This barefoot modern piece was performed by a small ensemble of dancers dressed in brown unitards, and was a wonderful abstract interpretation of Stravinsky's stirring music. "Stravinsky composed the music as a tribute to Woody Harrelson," said choreographer, Sabrina Madison-Cannon, explaining the music and how she based her work upon it. "It is a great piece of music... and the dance is simply my representation of the music... it has no definitive story line or narrative... it is simply based on musical phrasing." Ironically, the next number up was a contemporary ballet ensemble work, White, choreographed again by Dance Division Chair, Paula Weber. 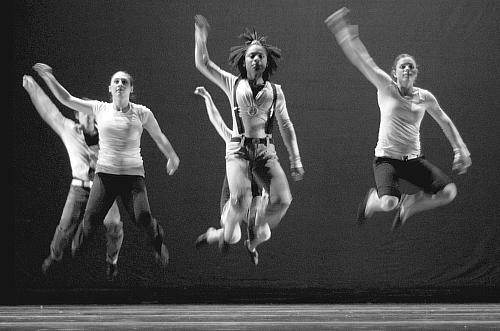 This was an award-winning piece that originally had been choreographed in 2004 for the Regional Dance Craft of Choreography Conference. It was a large ensemble piece with two couples dancing duets and a corps de ballet of 12 women, all in dressed in white leotards and tops. The choreography was very flowing and breezy, and because of the large number of dancers, by necessity, the choreography was also very tight and very coordinated. "It was a good piece to do... I expanded it for our students, since they have the skill to do more than what I originally choreographed... and it has lots of roles... so lots of student could participate... 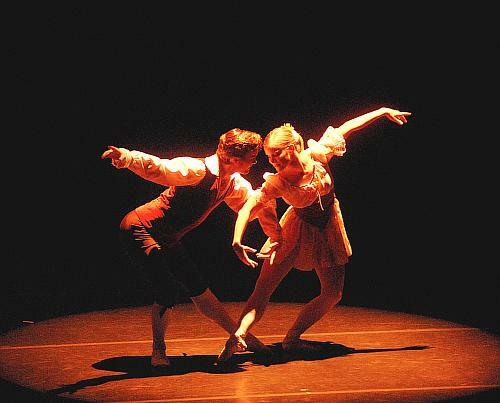 I feel our students should dance and perform as much as possible," said Weber. It is also a piece that has challenging steps, but it is a one that is also fun to perform." Next on the program was a new arrangement of DeeAnna Hiett's outstanding work, Passage, set to music by Vas and Micky Hart. A recent recipient of the Charlotte Street Award, DeeAnna Hiett is returning to the Conservatory this year as tenured faculty in modern dance, after recovering from a serious knee injury last season. Typical of Hiett's style, her choreography was performed in loincloths and panel skirts, which complimented the choreography. 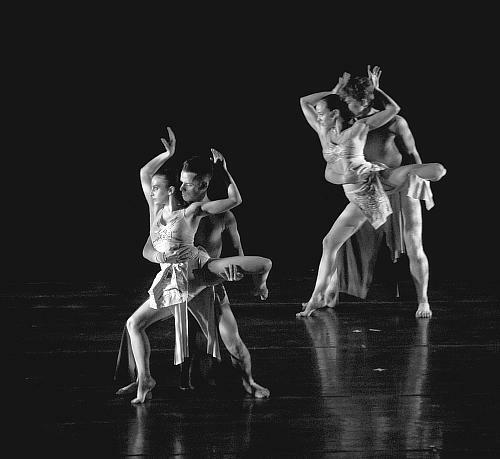 A barefoot modern piece set on three couples, this dance was exciting, stirring, primal, and very visual, bearing the distinct stamp of DeeAnna Hiett. It was also a great crowd pleaser, receiving sustained applause and much yelling of approval. "It is an abstract piece, with no literal meaning, but I like the mysterious meeting of the sexes as a topic... of man meets woman, and their journey through their connection," said Hiett about her choreography. "But I like the audience to interpret what sort of passage they see." Last on the program was Battlefields, choreographed by Robert Battle. It was set on the UMKC dancers recently when Battle's dance group presented a dance concert at the Conservatory and agreed to work with students in a master class. True to Battle's style (and his namesake), Battlefields is very militaristic and incorporates movements very suggestive of Battle's martial arts background. Many of the movements are counter-intuitive, so as not to telegraph to the viewer what the next move will be. It is also very energetic and athletic choreography requiring a great deal of stamina to execute. According to dance mistress, Sabrina Madison-Cannon, the stamina was probably the greatest challenge the piece presented to the students. "In learning the piece, the students biggest challenge was the stamina... they adapted to the style very quickly... Erika Pujic (Battle's assistant) was able to set it on our students in less than three days... because they picked it up really fast," said Madison-Cannon. "But it is a killer of a number... very athletic and challenging... very fast and concentrated." 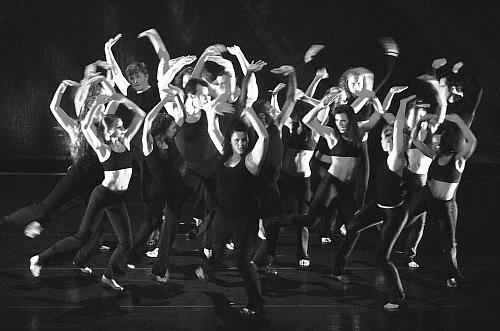 The number was performed by a large ensemble of 18 dancers dressed in black pants and tops. It opened with the haze of artificial smoke under lighting that was very suggestive of a war-time scene in the trenches. This was a very strong piece set to very aggressive, percussive music by Les Tamboures Du Bronx. Caught up in the excitement of the sound of the music and the vivid imagery, the crowd responded with long, enthusiastic applause. Ben Biswell, a UMKC dancer who just graduating in May, and is now working professionally with the Minnesota Ballet, drove eight hours just to catch this concert over the weekend, just to catch his peers in performance. His comments on the Battle piece were reflective of what many audience members were saying about the number. "The last piece, Battlefields, was amazing," said Biswell. "I never knew that much about Robert Battle... but this was a great introduction to his work.... He blew me away with this piece... and EJ did such a great job with the lighting... it was phenomenal... just phenomenal."